One of the most beloved and time-honored summer traditions enjoyed by children is bicycle riding. While bicycle can provide unparalleled freedom, there are also some significant risks that can result in injury and death. Statistics compiled by the Centers for Disease Control (CDC) even reveal that children between the ages of 5 and 14 are more commonly injured in bicycle accidents than any other sport. Accidents that occur at intersections involving turning. Frequently, in these accidents, children are crossing in front of a vehicle that either is attempting to turn left or right. Cars that collide with children. Often these accidents involve motor vehicle operators who are traveling too fast and children who are not paying proper attention. Sometimes, motor vehicle drivers fail to stop at a red light or stop sign, which leads to accidents. These are often deadly accidents and frequently result in children being thrown from bicycles. Wear helmets. Children should always wear bicycle helmets, which substantially reduce the risk of injuries if a child is involved in an accident while riding. It is not enough for children to wear a bicycle helmet, though. Instead, the helmet should be properly adjusted to fit the child’s head. The helmet should also fit the child as intended by the manufacturer. Most helmets are designed to fit level on a child’s head and sit above a child’s eyes so that vision is not blocked. Use Proper hand signals. When turning, children should be instructed to make hand signals so that other drivers are of aware of the direction they are turning, which helps to decrease the chances that a collision will occur. Obey the law. It is essential that parents teach children to follow all local laws while riding their bicycle. 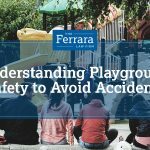 These laws differ throughout the state of New Jersey, however, which means that parents should make sure that children are familiar with any local ordinances. Use lights. When riding at night, children should make sure to use a bicycle light in addition to reflectors, which helps to make sure that the child is spotted by others who are traveling along the same road. Ride with traffic. Children must be careful to ride with traffic, which means that they should always ride their bicycle on the right side of the road or sidewalk and should remain as far to the right as possible. Maintain visibility. To remain visible to other drivers on the road, it is a wise idea for children to wear reflective clothing so that they can easily be spotted by others. If your child has been harmed while riding a bicycle, it is critical to quickly contact a knowledgeable accident attorney who can help fight for the compensation that you deserve. 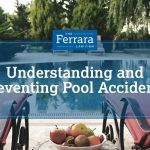 Contact Ferrara Law today to schedule a free case consultation. Our legal counsel understands how devastating bicycle accidents can be and will remain committed to fighting for the compensation that you deserve.